Recently, I have gotten to wondering about the fate of the classroom response system, or clicker. They tend to be nifty little devices for getting instant feedback from students. What the clickers do is not complicated. If you know how to make a form in Google Documents, you can make a survey or a test much faster than if you were to make one in any of the classroom response systems. Sure, it might not be as pretty, but as long as your students have access to computer lab or, better yet, have any mobile device (iPod, iPad, Phones, laptops, e-readers) they can take a quiz on the web, in or out of school. For minimal cost, using what you already have, you can easily do many of the things expensive clickers can do. 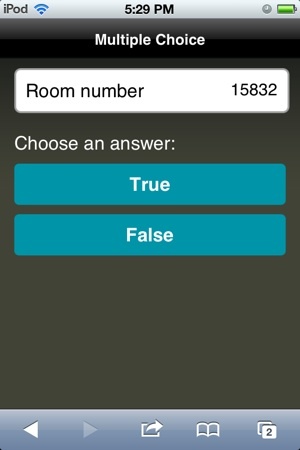 Recently I found something that put the last nail in the clicker coffin for me: a great little webapp called Socrative. As of yet, it is free (it’s beta right now; this may change). The service works on all internet devices. It easily allows a teacher to give on-the-spot assessments with a click of a button, or create in-depth quizzes. As for making the tests? The site is easy to use and it also allows you to create tests in an Excel file and import them. Some of the other great features include a race game where teams of students race each other using quiz questions and an “exit ticket” where students have to report what they have learned in a lesson before they are allowed to leave. The companies that make response systems should be scared; this is a great, easy-to-use service that works with everything I already have. Why would I spend a few hundred dollars on a response system if I get the same quality or better for free with Socrative?